Dear friends, ''sisouela villas'' complex consists of 4 x 2 bedrooms and 2 x 3 bedrooms villas with amazing sea and mountain views. All villas are bungalows with en-suite bedrooms and private pools. 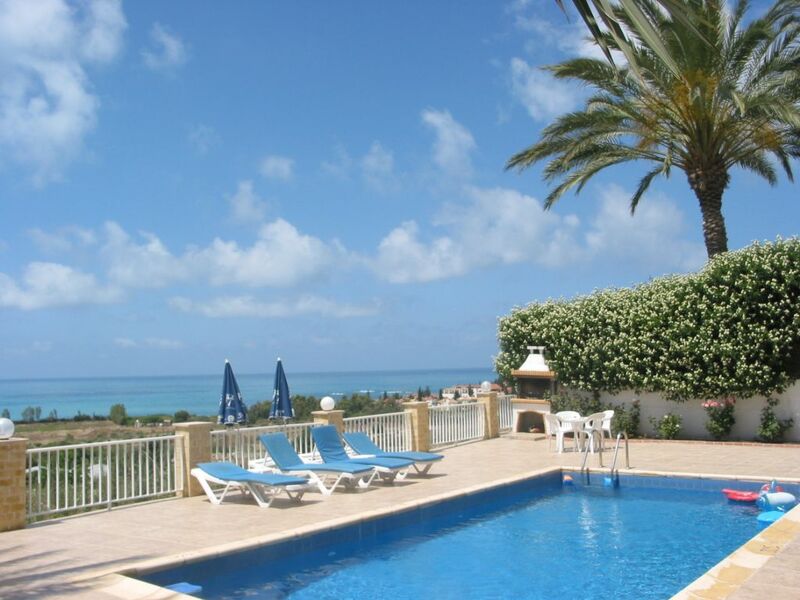 The ideal holiday destination in Coral Bay - Cyprus for families, couples & elderly people seeking relaxing holiday in superb surroundings with a great climate and friendly local people. It is a family run business and our main concern and priority is to make your holiday as pleasant as possible. Our house is in the same huge land(9500sqm) as our villas and we are there for you at any time, day or night should you need us. The villas are set on a small hill looking out across excellent views of the Coral Bay (in Paphos), Panoramic sea views of the Mediterranean, countryside, mountains and the banana plantations. Surrounded by a spacious paved terrace, you can enjoy to the full those panoramic sea views. This picturesque and tranquil setting is perfect for relaxing holidays, yet close enough to restaurants, bars and shops in Coral Bay. Excellent 2 & 3 bedroom villas with private pools. These attractive sunshine villas share the same scenic location and amazing panoramic sea views. Each villa has an open-plan lounge & dining room ( with TV, DVD, satellite and Wi-Fi internet) which is separated by a breakfast bar from an open-plan kitchen( with washing machine, oven & hops, fridge-freezer, microwave, kettle and plenty cooking utensils and equipment). Two or three spacious bedrooms ( 1 master & 1 twin or 2 twins). Private & peaceful, the ideal holiday destination in Cyprus for families, couples and elderly people seeking relaxing holiday in superb surroundings with great climate. Coral Bay '' a jewel in the island crown''. Beautiful countryside, a cosmopolitan resort, historic sites as well as sporting activities. Coral bay & Paphos region have something for everyone at any time of the year. Weather you are sun seeker, explorer or someone looking for relaxing holiday with great scenery, there are so many reasons to visit this beautiful part of the Cyprus. Coral bay beach is definitely worth writing home about. Where Paphos combines old and new style, this seaside holiday spot is all about natural charm. Undoubtedly it has got one of the best sandy beaches on the island. Coral bay is by no means as big and flashy as its neighbour. Nevertheless you will not be short on those holiday essentials, including banks, supermarkets, taverns, bars, various restaurants and shops. Of course Paphos is just down the road if you are looking for a more lively atmosphere. There you will find all the trapping of major resort, including lively nightlife. Its also the place for sightseeing, with fascinating archaeological museum and famous monuments such as the Byzantine castle, mosaics and the Tombs of the Kings. There are lots of small villages around. monasteries, wineries and country life you can visit in a 30 - 45 minutes driving distance. Coral Bay has got all your holiday needs covered. build in shower room. suitable for elderly & disable pople. covered veranda with wooden pergola, having all date shade and amazing view from where you can watch kids in the pool. please mention that during your request. we have villas where house floor level and pool patio level is the same. A delightful villa with surrounds kept in immaculate condition. The setting is superb with marvellous sea views to the front, mountains behind and flanked by fruit orchards. The facilities of Coral Bay and Peyia are a few minutes away while Paphos is only 15 mins drive. A car is a distinct advantage and the owner assisted in obtaining one at a favourable rate, enabling us to explore deep into the interior. The final plus for the holiday came in the form of the owner Simos for who nothing was too much trouble and treated us more like friends than hirers. We thoroughly enjoyed our holiday and recommend the villa very highly. This is a great villa in a great location. Ideal position as a base for getting around the Coal Bay, Paphos area and beyond. Very good layout with everything we needed and more for our stay. It is in a great position for sun worshippers as it gets the sun all day until late afternoon, the pool is lovely, ideal temperature for cooling off when you have had enough sun. The owner Simos is a gentleman, nothing is too much trouble for him. He popped in a couple of times during our stay to check all was well, told us when to expect the bedding and towels to be changed, and the villa cleaners to arrive. He always had plenty of time for a chat with us. You couldn't ask for a better host. We look forward to staying here again soon and meeting up with Simos again. Loved the villa, location and friendly welcome from Simos, from the moment we arrived we felt right at home. The property is perfect for a private and relaxing holiday with amenities just a short walk or drive away. Our 1st time to Cyprus and definitely not are last. The Villa is perfect for a couple and no doubt for 4 as well. It is nice and airy with plenty of room to spread out although we spent most of the time on the veranda, or by/in the lovely pool, where we also ate our meals which were cooked on the BBQ. (The charcoal here is the best I have ever come across!) The Leylandi hedge on either side gives adequate privacy and the views out to sea are great. Simos is a magnificent host and is easily conntacted when ever needed without being intrusive. Whilst a car is not essential as the Restaurants and shops are only a 15 mins stroll from the Villas and the Large Supermarket do deliver, we used that once and it was great, it is recommended as if you walk out for lunch it can be very hot. We walked in the evening as it was quite pleasant and the driver can have a beer or two! Although the buses are as cheap as chips costing 1.50 Euros each to Pathos. Overall an amazing two weeks which I would recommend to anyone. Thank you for your beautiful review. You make me very proud and you give me even more strength to welcome my people and help them enjoy their holiday. Immediately felt at home, property clean and well presented. Beautiful location- kind and friendly owner who resolved any query within minutes. Already planning on booking for next year and hopefully many years to come. These are the reviews that make me proud to be the owner of these villas, making my customers feel at home and comfortable to enjoy their holiday and return to their home happy. These beautiful words give us the strength to continue our work with a smile on our face to welcome our amazing guests to our villas. A very big thank you from the bottom of my heart for your fantastic review. Hope to see you soon. When it comes to atmosphere, the short distance between Coral Bay and Paphos might as well be a million miles. Where Paphos combines old and new in style, this seaside holiday spot is all about natural charm. It's undoubtedly got one of the best beaches on the island for a start. Stretch out on a sunbed while the kids splash about in the shallow waters of the bay. Make a bit of a splash yourself and have a go at water-skiing. Or for a more sedate water-borne experience, the pedalo – just the thing to float around the calm waters and take in the view. Coral Bay is by no means as big and flashy as its neighbor. Nevertheless you won't be short on those holiday essentials, including banks, supermarkets and shops. As for after dark entertainment. It leans towards the relaxed rather than the riotous. Have a drink or two in one of the many bars. Then while away the rest of the evening over a slap-up meal. With time on your hands, it's the perfect opportunity to try a 'meze' feast. With up to 30 dishes to savour, we're not talking fast food here. Of course Paphos is just down the road if you're looking for a more lively atmosphere. There you'll find all the trappings of a major resort, including lively nightlife. It's also the place for sightseeing, with a fascinating archaeological museum and famous monuments such as the Byzantine castle and the Tombs of the Kings. Coral Bay has got all your holiday needs covered.